The Franconian Circle (German: Fränkischer Reichskreis) was an Imperial Circle established in 1500 in the centre of the Holy Roman Empire. It comprised the eastern part of the former Franconian stem duchy — roughly corresponding with the present-day Bavarian Regierungsbezirke of Upper, Middle and Lower Franconia — while western Rhenish Franconia belonged to the Upper Rhenish Circle. The title of a "Duke of Franconia" was claimed by the Würzburg bishops. The Franconian Circle as at 1789, before the French Revolutionary Wars and the dissolution of the Holy Roman Empire. 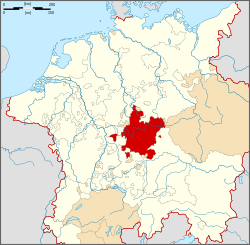 Prince-Bishopric Established in 741 by Saint Boniface, prince-bishopric since 1168, titular "Duke in Franconia"
The list of states making up the Franconian Circle is based on that in the German Wikipedia article Fränkischer Reichskreis.